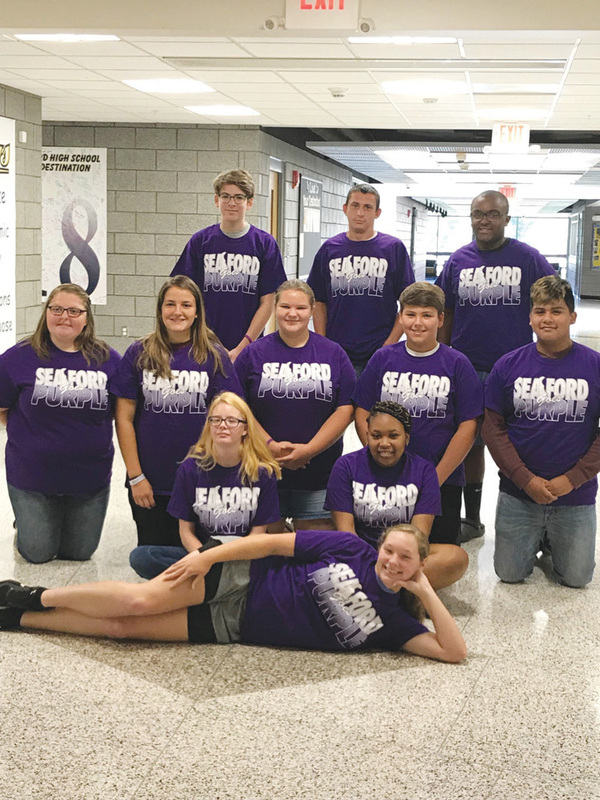 Seaford High School students spent three days this summer training to be Botvin LifeSkills Training Peer Mentors to Seaford Middle School students for the upcoming school year. The group is one of many trying to address the public health crisis in Delaware, and it will be hosting the Herren Project — a Project Purple Initiative, founded by former NBA basketball player Chris Herren, who himself once overdosed on heroin — which assists individuals and families struggling with addiction. “He was talking to a group of high school students, and one young lady raised her hand and said, ‘My friends and I are sober.’ He said you could hear the snickering in the crowd. He said he was so proud of her, that she had the confidence to do that, and she was wearing a purple T-shirt. That’s what prompted him to form this Project Purple,” explained Coldiron. Herren himself will be visiting Sussex County on Tuesday, Sept. 11, to share his story with the community. The free event will be held at Crossroads Community Church in Georgetown at 7 p.m.
Having overdosed from heroin in 2008, and making it through a drug treatment program, Herren has now been sober for 10 years. Coldiron said she hopes everyone in the community attends the free event, which will conclude with a brief question-and-answer session. Those who attend that evening will be able to visit a number of vendor tables, including Help Is Here Delaware — an online resource for those who are struggling with or know someone struggling with substance-use disorder. Those who wish to support the event may make a donation to the Sussex County Health Coalition or sign up to be a volunteer that evening. “There’s always a place for help,” said Coldiron. On Sept. 12, Herren will speak to middle and high school students in the Seaford School District in private events that will be closed to the general public. “He uses his celebrity to engage the students, but he does not say, ‘I’m here as a basketball player.’ He says, ‘I’m here as an addict in recovery. Let me tell you what happened to me. And, I want to give you hope,’” said Coldiron. Herren’s talk is being sponsored by Nanticoke Health Services, Beebe Healthcare, Bayhealth, SUN Behavioral Health, Highmark, AmeriHealth Caritas, DSAMH, Discover Bank and WBOC. Coldiron said the Herren event is the kickoff for what the coalitions hopes will be a multi-year drug-awareness and -prevention campaign in the county and throughout the state. “We also have two very unique programs we’re starting that are being looked at as possible national models,” she explained. “School-based mental health collaborative in four districts — Indian River, Cape Henlopen, Woodbridge and Seaford. The second program is Botvin LifeSkills Training, an evidence-based substance abuse- and violence-prevention program used in schools and communities worldwide. “It was started by a physician. They’ve had a tremendous success rate. It’s specifically for middle-school students. It’s not just around drug-prevention, but it’s also a leadership program. It’s life skills, its making wise choices. It’s acting from informed decisions and not impulse, how to handle anxiety — all of these things,” explained Coldiron. While those who use the Botvin program do not normally use peer trainers, Coldiron said it looks like a promising pilot program. Coldiron emphasized that education is important but addressing the stigma associated with substance-use disorder is just as critical. Coldiron said students on the Milford and Seaford high school field-hockey teams are planning to go purple on Sept. 18. The more engagement in the campaign the better, said Coldiron, noting that working together can make the difference. “I truly believe it is going to be this younger generation that is going to step up and say, ‘Enough.’ They’re going to do it by getting actively involved,” she added. For more information about Sussex Goes Purple and the work of the Sussex Health Coalition, visit delawaregoespurple.org. Those looking to volunteer at the Chris Herren event may contact Coldiron at lcoldiron@pmgconsulting.net. Anyone who is themselves or knows someone who is suffering from substance-use disorder can visit www.helpisherede.com for resources and programs offered throughout the state of Delaware.